No , it’s not. It is about freedom. The freedom to choose who you want to marry , without the government or the church dictating who can and cannot get married , and dictating what the definition of marriage should be. It’s not about forcing anyone to endorse anything. Anyone who sees this as being forced to endorse it , is genuinely stupid. They have been brainwashed into believing all of the anti-gay rhetoric and propaganda. Most likely they are fundamentalist Conservative Christians , who have a massive victim complex who genuinely believe they are being persecuted not only when someone criticizes them , but they actually believe they are being victimized by gay marriage. They believe gay people are like Nazis that want to force everyone else to be gay. 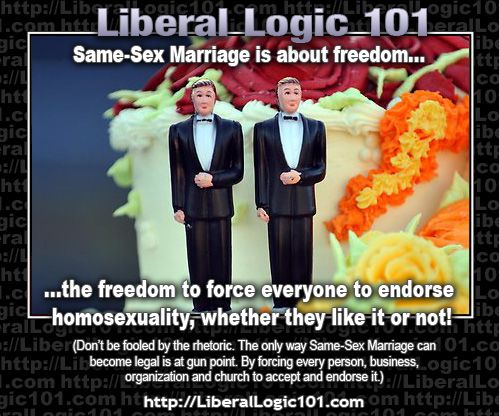 They honestly believe that gay marriage infringes upon their religious freedom. They believe gay marriage is a threat to heterosexual marriage. They believe that God will destroy America over gay marriage. Why hasn’t he done so already? How is it a threat to heterosexual marriage? How does it infringe on religious freedom? Gay marriage became legal in all fifty states , but it certainly did not happen at gun point. That’s the stupidest argument I’ve ever heard.